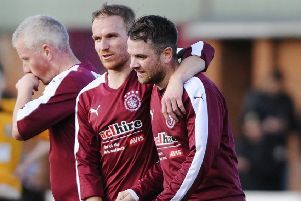 Linlithgow Rose made it a remarkable 19 goals in two games with a thumping win over Craigroyston at Prestonfield on Wednesday. Fresh from their 11-1 victory at Ormiston last Saturday, Rose rammed in another eight against their Edinburgh visitors to move up to third place in the East of Scotland League Conference C table. Chasing a third league win in a row, Rose were immediately onto the front foot with shots from Tommy Coyne and Owen Ronald being blocked. Kevin Watt then had a couple of opportunities before visiting keeper Chris Hill made an excellent save from Gary Thom on 20 minutes. But the deadlock was broken on 27 minutes following a good build up involving Watt and Coyne which culminated in Blair Batchelor finishing neatly from an acute angle. The hosts were by now moving the ball about well and could have gone further ahead but Hill saved from Watt and Martyn Shields. The visitors did manage an effort on target, but Kyle Marley saved a Chris Tobin free-kick. Prior to the interval Linlithgow should have stretched their advantage but Coyne headed over a Robert Sloan corner from a good position. However they wasted no time in extending their lead right after the break through a Coyne penalty after Ian Gray had been fouled. The third came on 56 minutes from a smart Watt finish and moments later Coyne made it four with another spot kick following a foul on Batchelor. The hosts were totally dominant, and it was no surprise when Ronald made it number five after getting on the end of an exquisite through ball from the trialist. The chances by now were coming regularly and Coyne netted his hat-trick on 72 minutes, heading in a Colin Strickland cross. 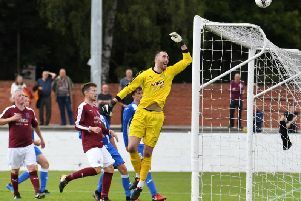 The visitors almost got a consolation with Hill heading just over but the seventh then came for Linlithgow with the trialist firing in from an acute angle. With the game petering out there was still time for one more goal from Strickland who scored from close range to net the eighth and to round off an impressive performance for the in form hosts.